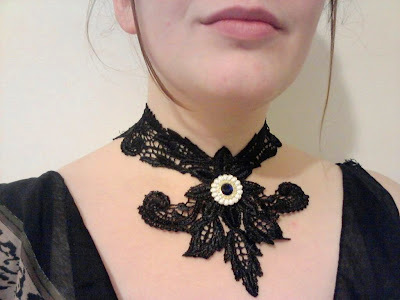 I made this super easy necklace by cutting a lace motif into a neat pattern, sewing ribbon to the ends to tie it back, and gluing a single earring to which I had lost the partner to the centre. I loved it! Unfortunately I wore it out the night that it was made and lost it. But it's so easy to make that I don't really mind.